CG: Could you tell us a little about your play - its origins or inspirational source, a quick plot summary, its themes, and what, if any, you're hoping will be a take-away for the audience? JD: My play is actually a pair of companion one-acts. Separate casts, separate circumstances, taking place on opposite sides of a doorway and united around the theme of how queer people relate (or, perhaps more often, don’t relate) to their straight siblings. STOP HITTING YOURSELF is about a gay man whose sister says exactly the wrong thing at exactly the wrong moment, and their relationship just spirals out of control. I LOVE MY BROTHER is about a trans man and his not-quite-estranged brother, and the way they determine to rebuild their relationship from scratch. I wanted to write a kind of meditation on the endings of friendships, familial and otherwise. How sometimes they’re over all at once, as a result of some single, explosive or defining action. And how sometimes they end quite slowly and invisibly, drip-by-drip, without anyone realizing until it’s much too late. How sometimes there is no single moment to pinpoint or blame, how these very precious things can come apart with no explanation whatsoever, no grand event, no satisfying reason. CG: When did you start writing plays and why? Do you write in other mediums? Do you have formal training? JD: I wrote my first plays as an undergrad, after falling down the rabbit hole of dramatic lit, and realizing that making a play was a bit like making a sculpture, a physical object, the tangible artifact of an event that hasn’t happened yet. I grew up intensely gay and intensely Catholic, so I was always sort of waiting around to receive my calling, either to the priesthood or to the eternal glamour of martyrdom, and thereby sainthood itself. In my final year of college, I did experience a flashpoint moment, a revelation. But it had everything to do with playwriting, and nothing to do with religion. I remember thinking at the time that it was every bit as powerful and undeniable and clear as if the holy spirit itself had swooped down and whispered in my ear that I was meant to join the clergy. Some days I worry that martyrdom may have been the more sensible career path. I hold an MFA in Playwriting from Indiana University and a BFA in musical theatre performance (little-known Drago secret) from Eastern Kentucky University. In addition to traditional plays, I’ve written more than my fair share of short fiction, as well as other experimental performance texts. JD: Unfair question. I think Tennessee Williams is what I'm supposed to say here, but Paula Vogel had a much earlier, much more profound influence on the course of my life. Williams came later, along with the queers who put on plays that felt like throwing parties: Ludlam, Busch, and Nicky Silver. Kondoleon's writing is a pinnacle for me, so funny and daring and magical and sad. The older I get, the more I think it’s possible to understand Beckett. But the more I think I understand Beckett, the less I probably do. Maybe sympathize is a better word. I sympathize with his work so much. It leaves me with such a hollowed-out feeling, but also an urge to fill those empty cracks with life while I still can. CG: Why are early readings with professional directors and actors beneficial to you and you work? JD: The thing I’ve learned over time is that the sooner you can bring outside eyes into a creative process, the better. I write so quickly and so frequently from a place of pure, unfiltered impulse, and my work takes so very many forms--lowbrow satire, high-concept social commentary, pseudo-magical tragedical, buckets of blood and gore, stream-of-language, plays-without-dialogue, choreographic riddles--that often I’m not sure what I’ve made until other people come into the world of the play with me. I LOVE MY BROTHER, in particular, is a very new direction for me, in that I’m attempting here to abandon the fantastical and the metaphorical, as well as the exhausting forced-perspective of dramatic structure, all the well-made things that make me cringe these days, in order to arrive at something more purely naturalistic and mundane and, perhaps, profound. CG: Could you share your thoughts on Atlanta theatre from a writer's perspective? Is this a nurturing town for new work? Do you find more open doors or closed ones? How has Atlanta grown (or not) over the years for playwrights? Do you feel that our theatre community serves as a launching pad for wider exposure? 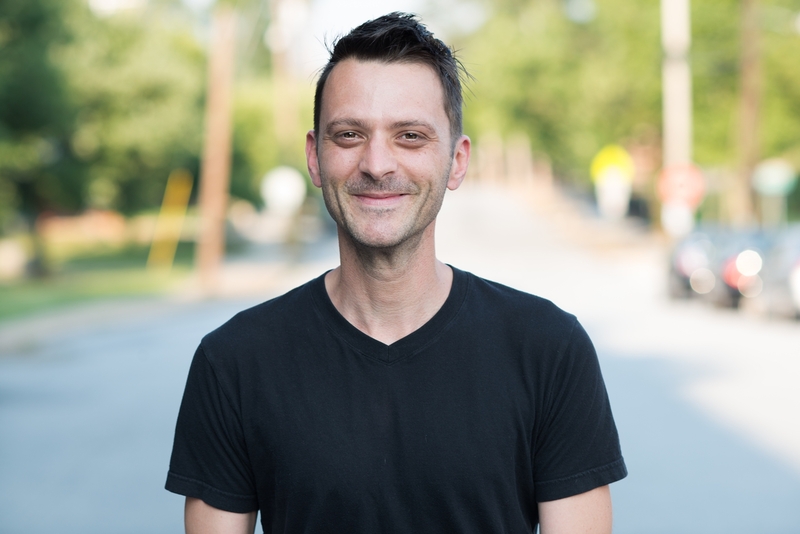 JD: Since moving here in 2004, I've had widely varied experiences with Atlanta theatres. Some doors are open, some will always remain closed. The Process Theatre has been extremely generous and nurturing to me, a real lifeline at times. I’ve gotten to do lots of fun things with Actor’s Express and 7 Stages over the years. And I’ve produced a lot of my own work, as well. The visual arts community has been very curious about and supportive of the various incarnations of my career here, and I can’t thank institutions like Mint Gallery and Dashboard and the Office of Cultural Affairs enough for providing me with the resources and space to experiment with theatrical work that doesn’t quite have a home in Atlanta just yet. I think circumstances have indeed changed for local playwrights over the last few years. The literary performance scene has blossomed in such a way as to attract, not only poets, essayists, and fiction writers, but playwrights as well. I think belonging to this community has given us a greater sense that our work has significant value, even outside the context of our own field. Events like Write Club have served to make us more facile and fast and flexible, to offer a real bond and sense of friendly competition I don't think we necessarily shared before, and which has set us all much farther along on our own individual paths. CG: Can you give three pieces of advice for early-career writers? JD: 1) Read and write and, yes, self-produce as much as possible, before deciding whether or not to shoot for the grad school thing. Don’t go into it unless you know how to milk the resources of academia for all they’re worth. 2) Contemporary dance is to theatre what abstraction is to portrait painting. Literalism can be a trap. 3) Head down, eyes on your own test, no comparing careers. You’ll only want to jump from something tall. For more information on the Threshold New Play Festival and for tickets, visit: www.actors-express.com/readings.